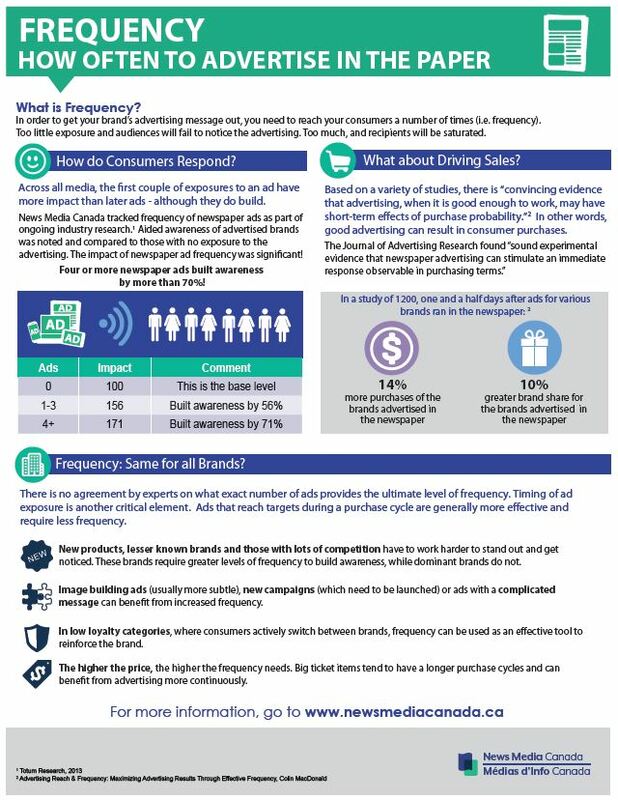 What is frequency, how do consumers respond and what about driving sales? These questions are addressed in News Media Canada’s fact sheet on Frequency. News Media Canada has been tracking frequency of newspaper ads as part of ongoing annual industry research. Aided awareness of advertised brands was noted and compared to those with no exposure to the advertising. The bottom line: the impact of newspaper ad frequency is significant. In order to get your brand’s advertising message out, you need to reach your consumers a number of times (i.e. frequency). Too little exposure and audiences will fail to notice the advertising. Too much, and recipients will be saturated. Across all media, the first couple of exposures to an ad have more impact than later ads - although they do build. News Media Canada has been tracking frequency of newspaper ads as part of ongoing annual industry research. Aided awareness of advertised brands was noted and compared to those with no exposure to the advertising. The impact of newspaper ad frequency was significant!